Hi There! Hope lovely people are all doing well. With a break from my full time tiring job, I wanted to share my time with you. Don’t you love this time of the year? Only sixteen days till Christmas. There is something about the month that makes me feel so jolly inside. You can be of any religious to be part of all these jolliness. 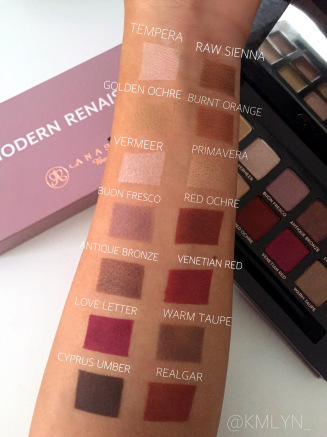 Today, I want to share with you my review of the Modern Renaissance Eye Shadow Palette from Anastasia Beverly Hills available at Sephora for $42. 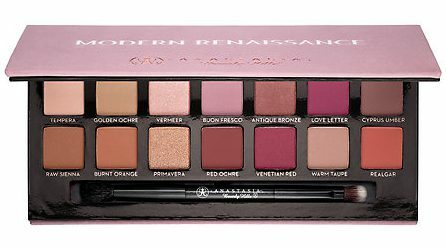 Description: This palatte puts a present-day take on Renaissance colors, this eye palette features 14 shades that let you create stylish, day to night looks. From the earthy yellow and ultra-matte finish of Golden Ochre to Primavera’s shimmer gold with a metallic finish, this palette’s high-pigment shadows are crease and fade-resistant and are sure to bring modern elegance to your eye looks. Ingredients: Mica, Dimethicone, Boron Nitride, Nylon-12, Zinc Stearate, Polymethylsilsesquioxane, Zea Mays (Corn) Starch, Zinc Myristate, Glycerin, Silica, Vinyl Dimethicone/Methicone Silsesquioxane Crosspolymer, Caprylyl Glycol, Cyclopentasiloxane, Hydrogenated Lecithin, Isopentyldiol, Lauroyl Lysine, Phenoxyethanol, Polysilicone-11, Tocopherol, May Contain: (+/-) Yellow 5 Lake (Ci 19140), Carmine (Ci 75470), Iron Oxides (Ci 77491, Ci 77492, Ci 77499), Titanium Dioxide (Ci 77891). *Contains Carmine as a color additive. Verdict: To be honest, I was skeptical about getting such a bold palette but it is worth it. You can get so many versatile looks, from neutral to bold. The shadows are very pigmented and a little goes a long way! They are also very buttery and incredibly easy to blend. My only problem is sometimes it’s too easy to over-blend. I usually blend my shadows a lot, but for these, I need to blend very lightly or else they blend out too much. If you think about it, it is less expensive than a lot of other comparable palettes which is nice. I will share some of the looks courtesy of Anastasia Beverly Hills. Hope you enjoy this as much as I love writing this post. 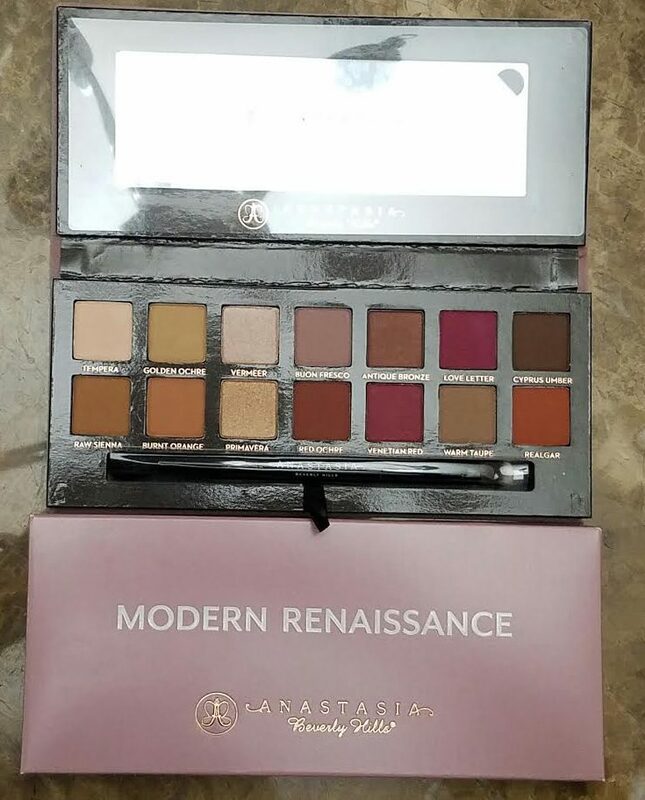 This entry was posted in Beauty, Beauty products and tagged Anastasia Beverly Hills, Eye Shadow Palette, Modern Renainssance Eye Shadow Palette, Modern Renaissance, Sephora by allaboutme31. Bookmark the permalink. Me too. I love how versatile it is.